Lake City, Michigan—(March 4, 2014 – Globe Newswire)—Two years after suing the Michigan Department of Natural Resources (DNR) over the legality of its swine Invasive Species Order (ISO), Mark Baker is now free to raise and sell his hybrid heritage breed pigs. In a February 26, 2014 hearing, less than two weeks before a scheduled March 11, 2014 trial date, DNR backed off its prior position that Baker’s pigs were illegal, in order to avoid the lawsuit trial. During the hearing Assistant Attorney General Harold Martin stated to Judge William Fagerman that Baker’s Russian boar hybrids do not violate the ISO. With the pigs’ legality no longer in dispute, the judge granted the department’s motion to dismiss Baker’s lawsuit. Even though Baker’s pigs are now legal, he lost the opportunity to challenge the constitutionality of the ISO for more than 2000 other Michigan heritage breed hog farmers. The judge dismissed the case with prejudice, meaning the DNR cannot take any future action against Baker for the pigs he is now raising on his farm. 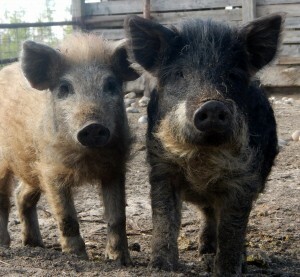 In December 2011, DNR issued a Declaratory Ruling prohibiting the possession of various swine, including the “Russian wild boar.” In the ruling DNR stated that pigs would be prohibited based on their physical characteristics; a pig with a straight tail could be prohibited and so could a pig with a curly tail. Baker filed suit on February 23, 2012, challenging the legality of the ISO and the Declaratory Ruling, and continued raising Russian Boar hybrids after the order went into effect on April 1, 2012. Among the reasons Baker chose to cross breed the Russian Boar with his free-range Mangalitsa pigs was to improve their ability to survive the harsh Michigan winters. DNR counter-sued Baker, and until recently, was seeking fines of $10,000 for each of the 70 “illegal” pigs the department claimed the farmer had. DNR also sought a court order to destroy the pigs. On February 26, 2014 DNR reversed its position and suddenly the pigs the department sought to condemn were now legal. Before the ISO went into effect, the farm’s Mangalitsa pork was highly prized by local chefs and consumers. After the order, Baker lost access to USDA facilities to process his pork. The ISO not only cost Baker his pork sales to restaurants, but other farm products as well. Baker’s case has already made an impact beyond Michigan. In January the Indiana Board of Animal Health amended a regulation on wild hogs that partly based their legality on physical characteristics to clarify that the regulation did not apply to hogs raised on a farm. DNR’s court battles over the ISO are not done yet. A Marquette County judge is scheduled to rule on a challenge to the ISO from another farm within the next couple of weeks. The Farm-to-Consumer Legal Defense Fund defends the rights and broadens the freedoms of family farms and artisan food producers while protecting consumer access to raw milk and nutrient-dense foods. Those concerned can support the FTCLDF, a U.S. based 501(c)(4) nonprofit, by joining or donating online at farmtoconsumer.org or by calling 703-208-FARM (3276). As a member of the Farm-to-Consumer Legal Defense Fund, Mark Baker requested financial assistance with his case. He is currently being represented by Attorney Michelle Halley; she successfully handled the case for Randy Buchler. The Fund is not an insurance company and cannot guarantee representation on all legal matters; possible representation is just one of the benefits of membership. View other FTCLDF Cases. You can help the Fund by donating to defray the legal expenses involved in this and other important cases. We talk to Mark Baker of Baker’s Green Acres, a family farmer who has been under attack for almost 3 years from factory farms using their political clout to shut down their competition from small family farms that raise a premium product. In December 2011, the State of Michigan declared heritage pig breeds that had been raised by farmers for decades to be ‘feral’ pigs. The designation was based simply upon physical description, not upon the behavior of the pigs or health issues with the meat. In fact, Mark Baker raises his pigs in a way where they can free range on his farm getting exercise and sunshine just like grass fed beef or free range chickens.